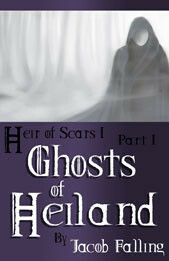 Ghosts of Heiland, Heir of Scars, Part One, is being featured at two separate sites this weekend: The Kindle Book Review and Awesome Trilogies and Series. The Kindle Book Review promotes independent authors whose books appear primarily on Kindle and have received good reviews (4-star and up). Awesome Trilogies and Series only features books that are part of series and are also well-regarded. Both sites a re a great place to find books that may not have received the exposure they deserve.